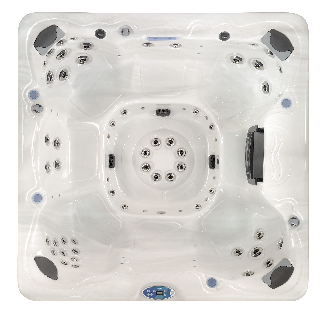 The high velocity volcano jet located within the large dome footwell ensures everyone can have a great foot massage in this seriously spacious 7 seater hot tub. The Grand is an all seater, which is ideal for families and those looking for a large party hot tub for socialising and entertaining. You will still benefit from the therapeutic massages Vita Spas are known for thanks to the Grand’s 64 customisable stainless steel jets..
We’ve included the MP3 Bluetooth music system and 150watt subwoofer as standard, as well as the strategically placed colour change LED lighting and coasters, so all you need to do is choose the shell and cabinet colour from our wide range! Why not come and visit our Kent showroom to try this fantastic hot tub out for yourself? If you’re looking for something smaller, the Monarque hot tub is the exact same layout in a smaller size.